USS Pennsylvania (BB-38) leads Battleship Division 4 of Task Group 77.2 in Lingayen Gulf during the landings on Luzon in January 1945. 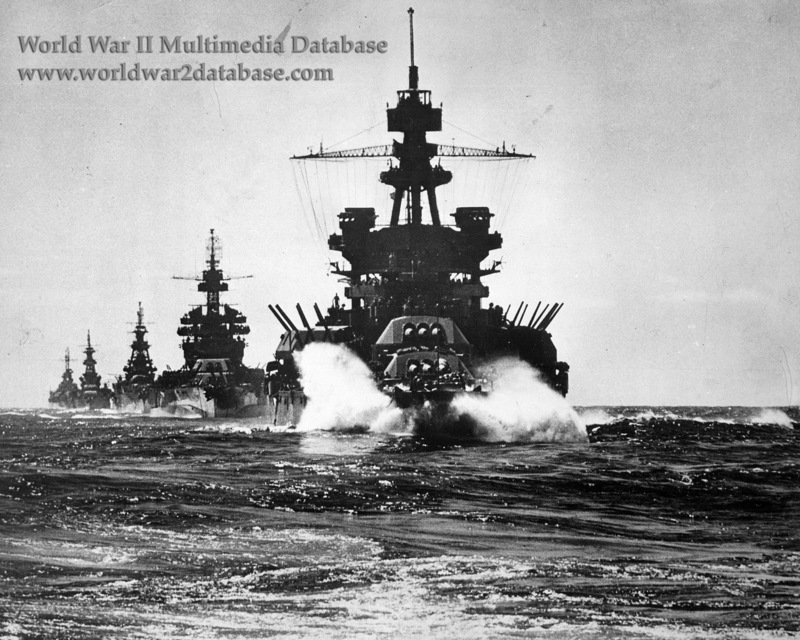 Following are USS Colorado (BB-45) and Cruiser Division 4: USS Louisville (CA-28), USS Portland (CA-33) followed by the light cruiser USS Columbia (CL-56). A wartime censor has doctored the radar on Pennsylvania. TG 77.2 also had HMAS Australia and HMAS Shropshire attached. Australia was hit on January 5, 6, 8 and 9 by a total of five suicide planes, losing three officers and 41 enlisted killed and one officer and 68 enlisted wounded. Colorado was hit by Japanese 5-inch shells on January 9, causing 99 casualties. On January 5-6, Louisville was hit by two Japanese suicide planes but remained on station to support the invasion. On January 6, Columbia was near-missed by one Japanese suicide plane and hit by two others, causing serious damage to the ship and killing 13 and wounding 44 of the crew. On the morning of the landings, January 9, as Columbia lay close inshore and so surrounded by landing craft that she was handicapped in maneuver, she was again crashed by a kamikaze, knocking out six gun directors and gun mount. Twenty-four men were killed and 97 wounded. At 0930 Hours over 68,000 men of General Walter Krueger's U.S. Sixth Army landed at the coast of Lingayen Gulf meeting no opposition. Within a few days, the assault forces had quickly captured the coastal towns and secured the 20 mile long beach, including the town of San Fabian.